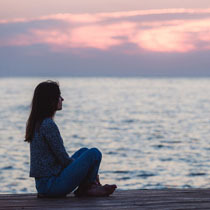 The following is a guest post from Megan, who agreed to share her “story of recovery” with all of you. Megan is a member of my private Facebook group, where shared comments about her wardrobe and style evolution that I thought would be inspiring for all readers of “Recovering Shopaholic.” I asked her if she’d be willing to expand upon her story so we could all learn from her experience, and this post is the result. This wasn’t what my closet looked like when I started my journey! 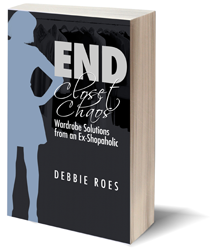 My story started with a prolonged mental state of “I hate everything in my closet!” I remember that I was running late all the time because it took me forever to get dressed, and I still felt unhappy when I finally did get out the door. I melted down in the middle of great vacation trips because I was not wearing appropriate clothes. I was constantly in the “shopping cycle” but had no good outfits to show for it. Because of the sheer volume of my shopping activity, I had to stick with sales and clearance rummaging in order to stay within my budget. But the clearance items (which tend to be after-season castoffs) would cause me to second-guess my choices and ruminate for days or weeks on end. When it got close to the end of the return window, I’d collect everything I hadn’t worn and brought it all back to the stores in order to fund my next shopping rush. You must be exhausted reading along, so I guess it’s not hard to imagine the misery I was going through. During this time, the minimalism movement came to my attention and many style experts were writing about the challenge they faced in helping their clients to de-clutter their closets. I was saddened by the fact that I had no such problem at all, because I had absolutely no emotional attachment to my belongings. My clothes were regarded as “consumables” that I acquired with little thought or commitment. I often couldn’t wait for garments to run their course so that I could cycle them out, whether that was weeks or months later. Purging was easy at first due to that exact reason, but it became harder later on when I realized I was still buying the same crap, which rendered the whole purging process a “churn” and meaningless. So I paused my acquisition while continuing to purge using many of the tactics Debbie has shared on her blog: the “hanger trick,” the first impression test, keeping an outfit journal, cost-per-wear, etc. Finally, I got to the point where everything in my closet was what I loved and would wear, but there were only 15 pieces (out of 200+ where I started)! I muddled through 9 months with only these 15 pieces while I was intentionally experimenting and studying fashion and style principles. When I set my mind to it, it became easy to grasp the basic ideas of color, silhouettes, and proportions. I started dressing like a magazine illustration or a walking textbook of current trends. I am known as an avid learner who always finds inspirations to assimilate, which can be a double-edged sword. When I had my first global engagement with my job, one of our cooperating teams from Hong Kong consisted of three ladies who always showed up in crisp button-downs, sleek blazers, or luxurious black cashmere no matter what the dress code was. The day after I arrived, I went out to the mall during a break and bought seven blazers, in a foreign country, at steep full prices! I know the definition of insecurity so well… The irony was that I still didn’t feel “right” even in those amazing blazers. One day, I had a light bulb moment when I was acting “tough” towards one of my direct reports and he crashed. For all these years, I was “power dressing” and expressing a different personality than my authentic one. I slowly recognized that my management style involves connecting and empowering, which is equally effective as being authoritative and directing. This tunes in with my style personality as well. I feel more confident and authentic when I’m dressed in a fluid, understated manner than in a dark, angular structure. This is the second step of style revelation that can hardly be taught. It is a process of self-discovery and self-acceptance. We all fall into the trap of aspiring to someone else’s personality or look, but the emulation usually fails because you can never do better acting as a personality or style than the people who are naturally that way. Why abandon your own strength, which may just need a bit highlighting to become an equally shining signature? And the beauty of it is that you no longer compare and feel the you come up short, because you are at your best, which should be the only thing that matters. Here are some examples of the outfits I like to wear today. All of these looks exemplify my current fluid, understated style and make me feel happy and true to my personality and strength. These are the types of outfits I love to wear now for my various life activities. A big thank you to Megan for sharing her story with us. If you have any thoughts regarding this story or would like to share similar experiences, please feel free to comment. I will be back soon with update on my theme for 2015 (see my last update here), as well as my November accountability update (see earlier ones here). This entry was posted in Guest Posts, Minimalism, Stories of Recovery. Bookmark the permalink. Would love to see more of Megan’s outfits and find out what her favorite pieces are. I love her idea of fluid understated pieces. Hi Jona. Thanks for your appreciation of my outfits. If you ever interested in joining the Facebook group that Debbie created you’d see a lot of outfits illustrating various style personality. As for me there are many other elements to my style than just fluid and understated, but they all center on my gentle but powerful personality trait. I no longer wear very dark outfits because I feel it drains my energy and make me look dull and sick. My coloring preference is rich saturated tone that is neither too bright nor too muted, and towards the cooler side. I prefer clothes to drape on my body without being too body con or baggy. My work wear are more of classic silhouette while casual wear has a bit of a quirky twist. Cute shoes are my major accessory then jewelry or scarves as I prefer less visual clutter near my face. I hope my sharing help you hone your own style. Yes, we would love to have you in the Facebook group, Jona! Megan shares her lovely outfits on a regular basis, as do many others. Plus, there are lots of great conversations going on there all day long. It’s really a wonderful group! I love “a process of self-discoveryand self-acceptance” as a foundation for building a personalized, workable and true to yourself wardrobe. Well-done! Thank you for sharing your inspiring story. You are a brave and amazing woman to have learnt so much from your experience and share your thoughts with us. I’d say you hit your “style sweet spot”. Balance and being true to yourself are the key. Well done. I loved reading it the second time too! You have helped me be comfortable with where I am and to know that balance is the key to a happy wardrobe. Tonya I even read it for the second time. It looks so much better after Debbie’s editing and touching up. She is truly a great writer! Thank you, Megan, but I agree with Tonya that you write very well, too! I always touch up the guest posts a bit, but I’m sure if I passed one of my articles on to another blog, they would find a few things to spruce up, too. I loved what you wrote and I thank you again for doing it! Hi Sybil, Di, Lori, Tonya, you girls are so lovely to come over and comment again! I really appreciate it. Love you all! Megan, thank you for taking the time to write this piece and share your story with us. I very much enjoyed reading about your process and where this learning curve has taken you. Much of what you write reminds me of what I went through over the past five years. Although my learning curve was steep and it took me a rather long time to figure out what was best for me. It is so important to find our own rhythm, and to find what works best for each of us personally, and for our own lifestyle, and I’m so glad to hear you have arrived, and have found a happy balance within your wardrobe and in your life in general. I’m cheering for you! Terra, it took me a decade to finally arrive at the equilibrium state in both my wardrobe and my emotions. I may not be suffering over the entire self-discovery period due to unawareness, but I was definitely not at my best. I love your term of finding our own rhythm, as it extends beyond our shopping or wardrobe and into more profound psychological and personal development areas. A lot of times we keep shopping because we don’t think we have the right one. 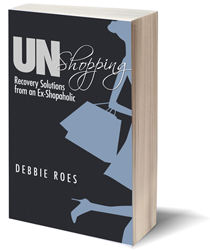 So when we manage to feel satisfied with what we own, the shopping urges naturally subdue. Cultivating this contentment needs a wardrobe that reflects our authentic style and a peaceful, non-perfectionism heart that can accept “good enough”. Thank you for sharing your inspiring story with us Megan, I’m sure it will help a lot of people understand how wardrobe churn happens. I have no emotional attachment to clothing either and I used to do the same as you. Congratulations on finding your style. It was good to read your story. I often read about people who total up everything they’re going to return and wonder how that works for them. Your description suggests to me that it doesn’t work! BTW – I love those black/white shoes. They’re stylish.